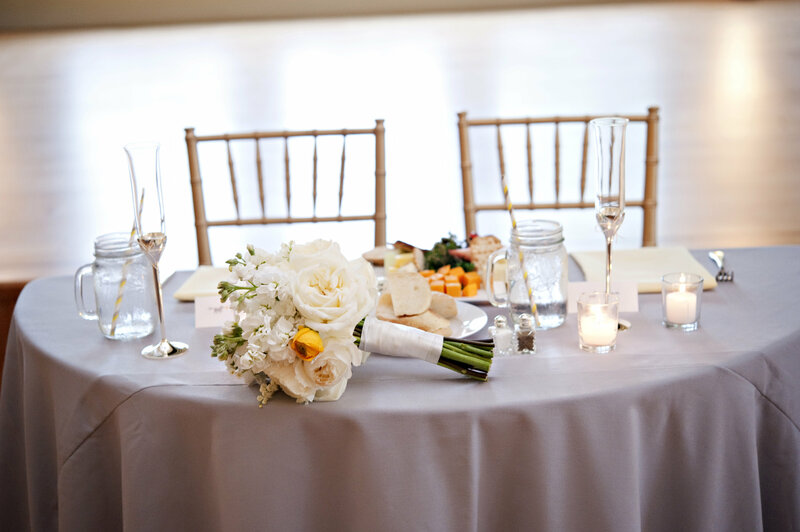 We are still catching up on blog posts from our 2016 weddings but super excited to finally show you the amazing images from Ashley and Ryan’s wedding at Bluemont Vineyard that were taken by Bekah Kay Photography. 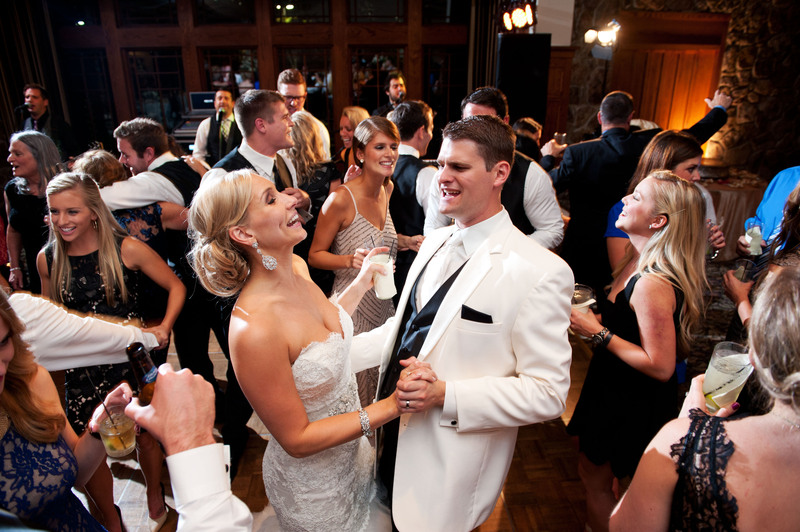 Now let me tell you, these are two of the kindest, coolest people you will ever meet. 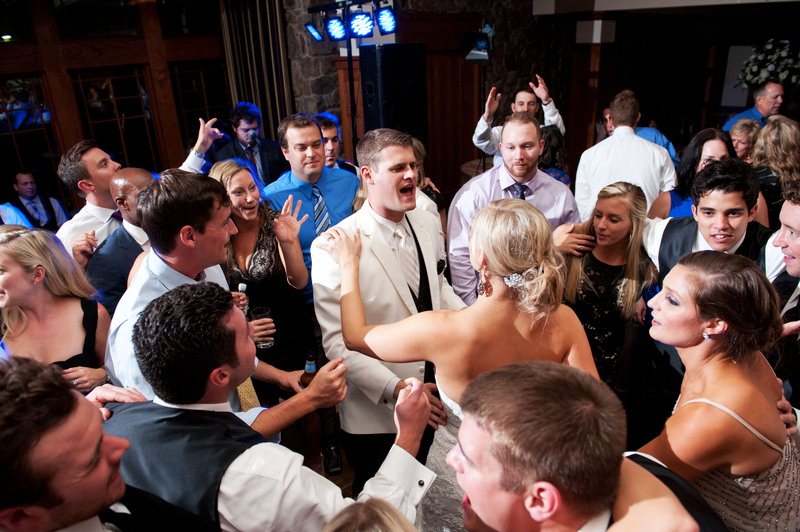 They have a large group of loyal and fun friends which made the entire day a complete joy and fun to be around. 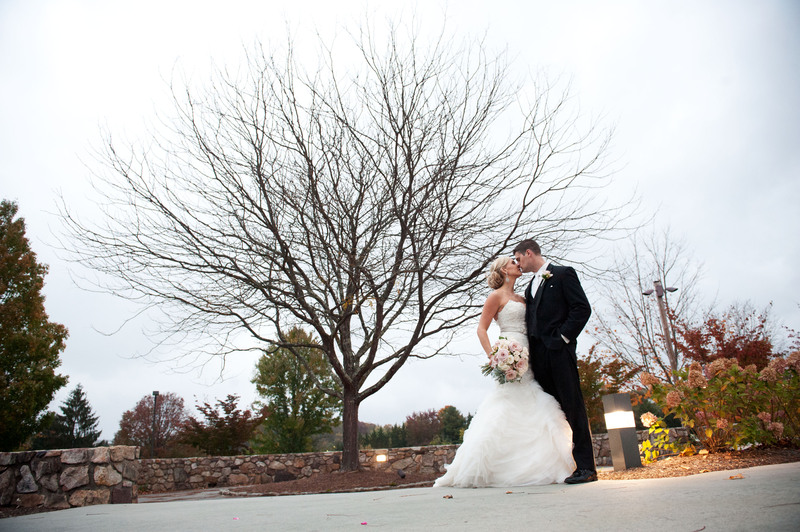 Getting married in November means you never quite know what to expect from the weather but this day in November was gorgeous, the sky was so clear you could see for miles and provided a beautiful backdrop. 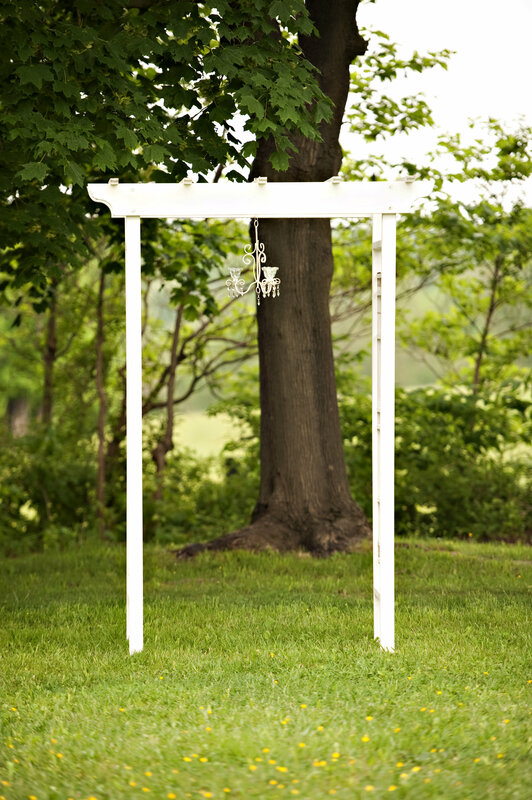 For the outdoor ceremony, we setup a chuppah and attached her father’s tallit, it was such a personal touch and really created a dramatic focal point in front of the blue sky. 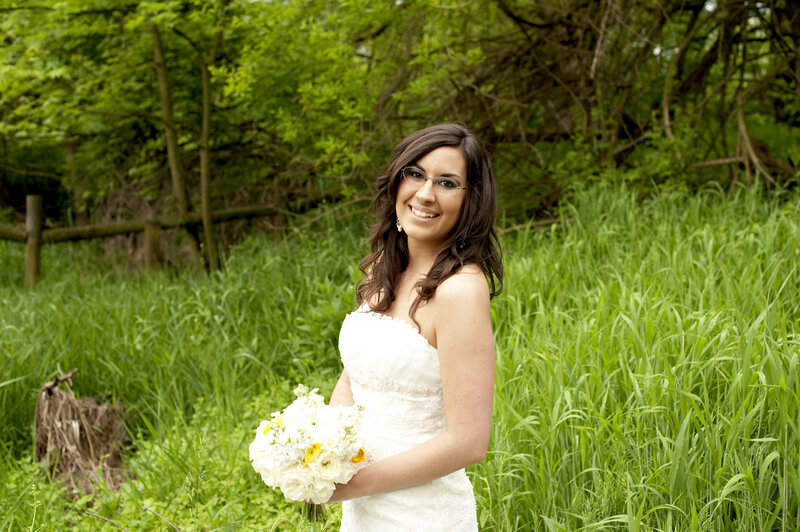 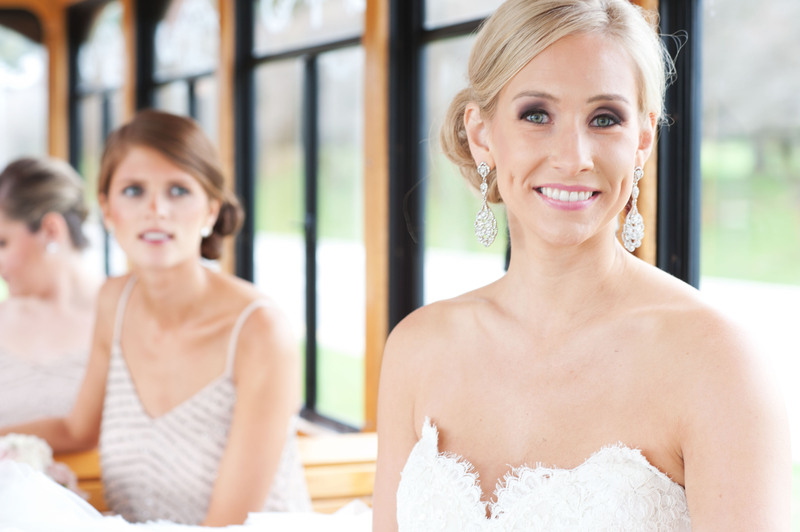 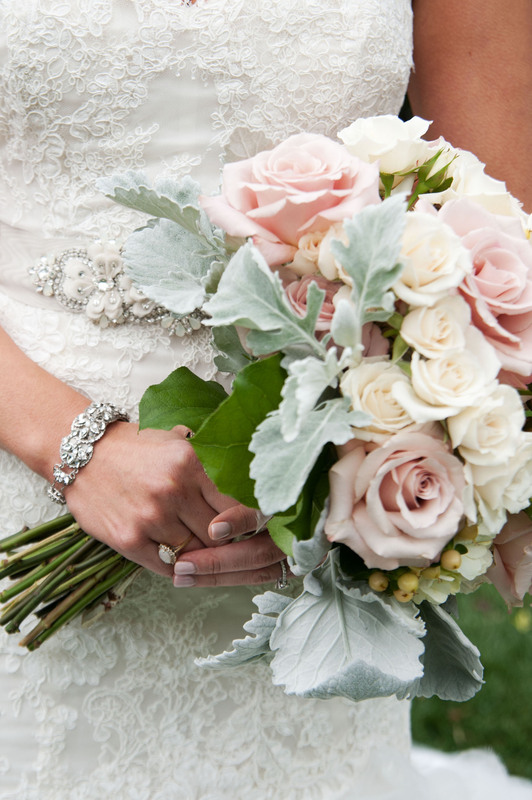 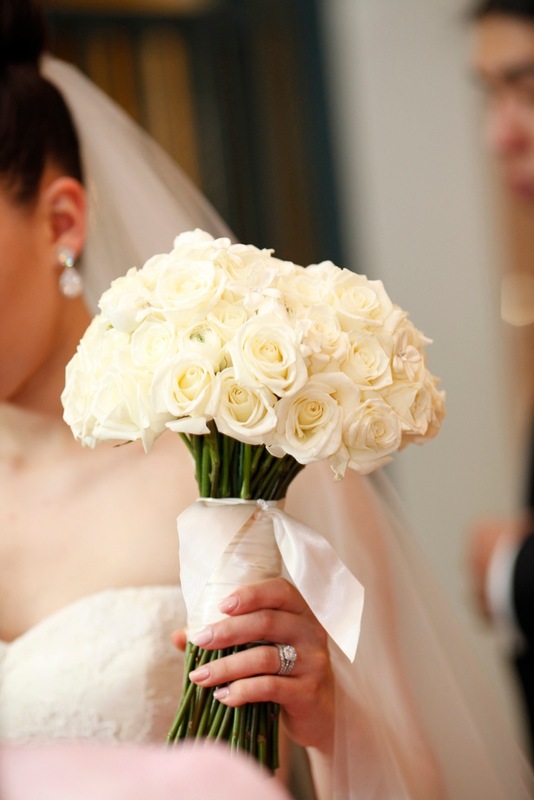 Ashley carried a stunning cascading bouquet that we absolutely loved making. 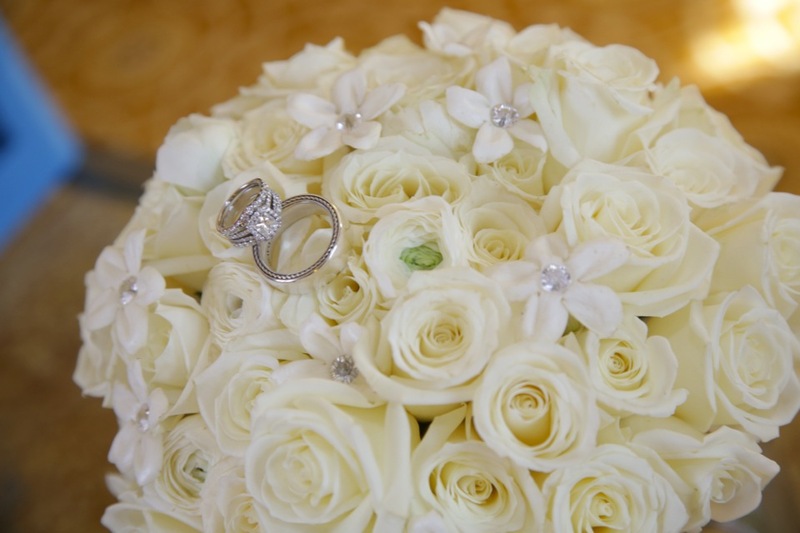 Her bouquet had a variety of all purple flowers and greenery that included cool water roses, mokara orchids, freesia, calla lilies and variety of eucalyptus. 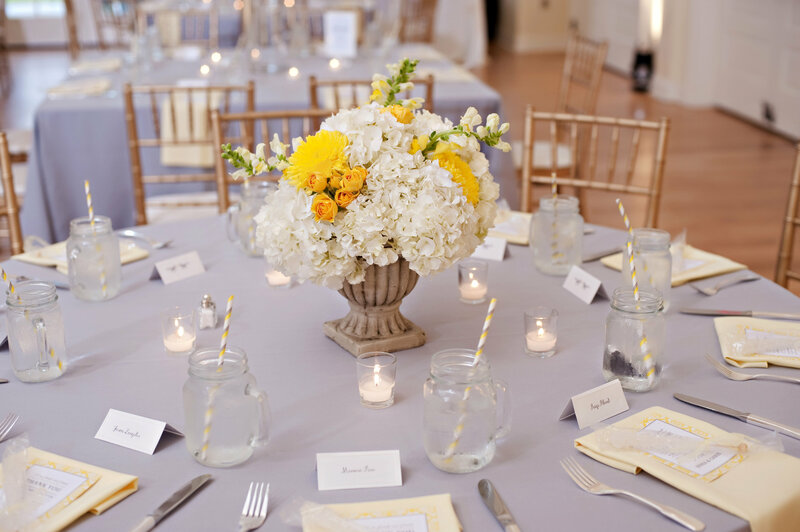 The centerpieces were two different designs, one floral arrangement with a variety of textures and fall tones that included dahlias, mums, marigolds, scented geranium and greenery and the other a distressed ivory lantern with greenery and flower blooms surrounding it. 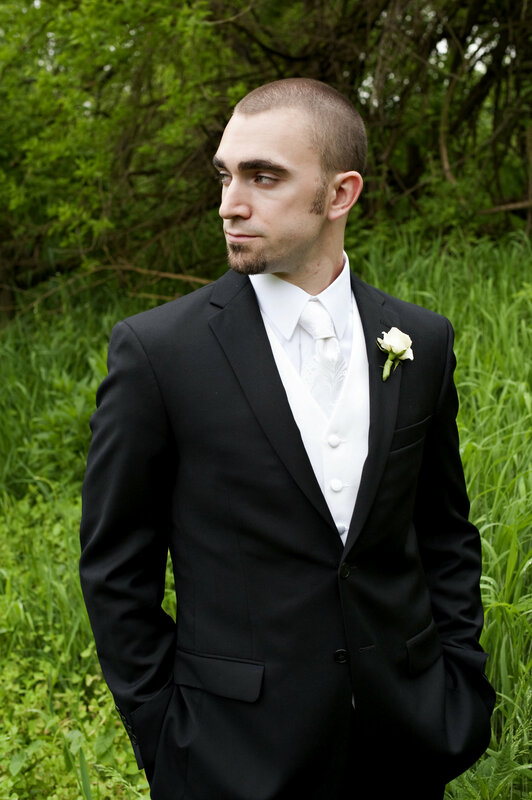 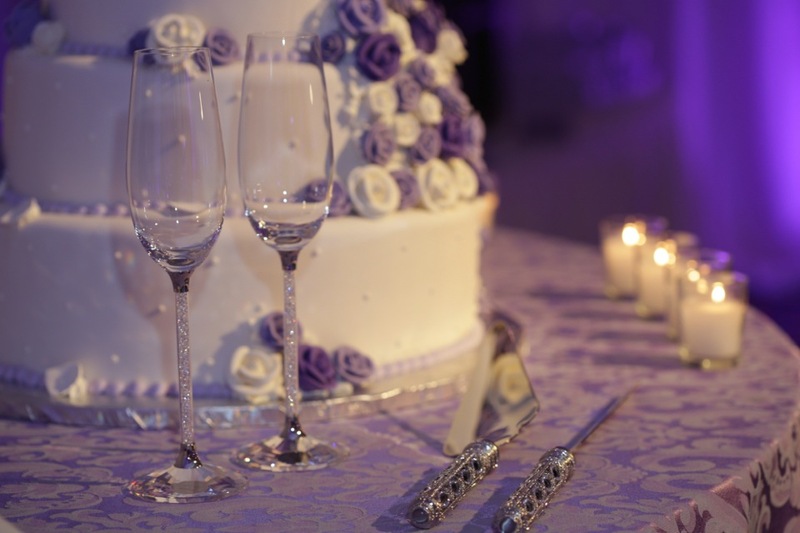 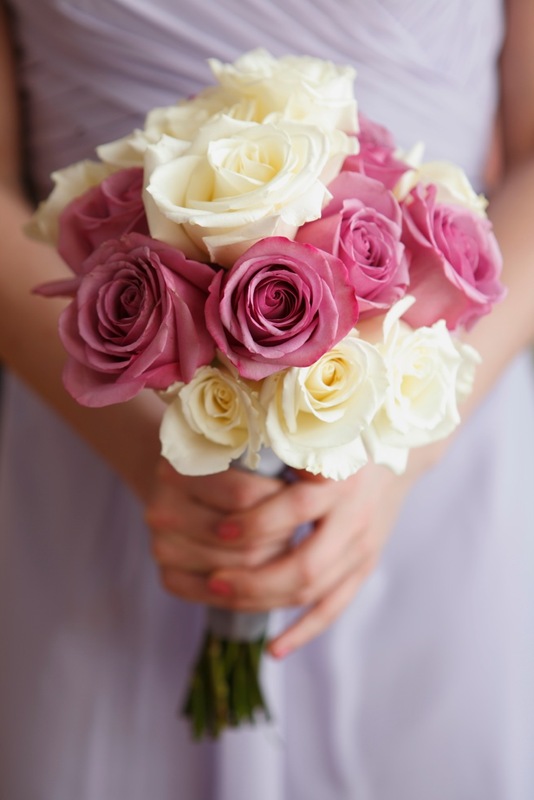 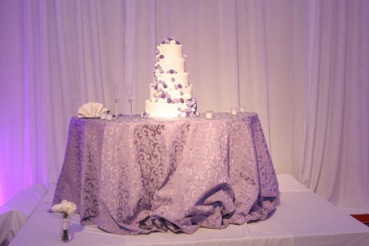 The shades of purple with orange and ivory accents, went perfect for a fall wedding. 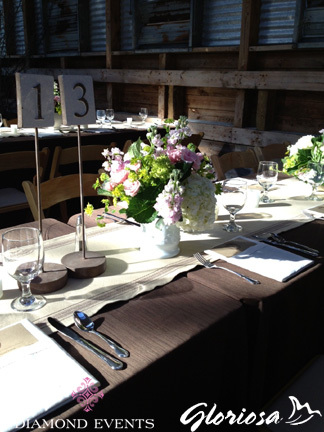 Congrats Ashley & Ryan, we absolutely loved doing the flowers for your wedding. 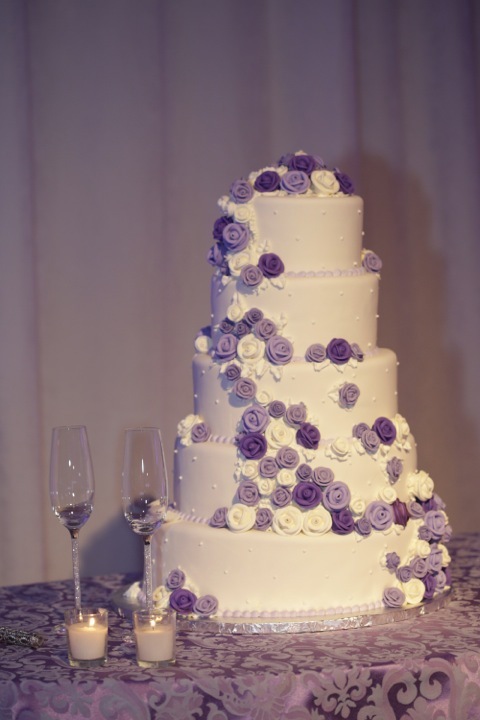 We wish you the best!! 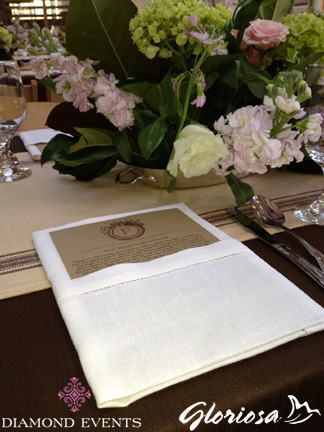 Oh where to start, Jamie and David’s wedding was AMAZING, I am not sure how else to say it. 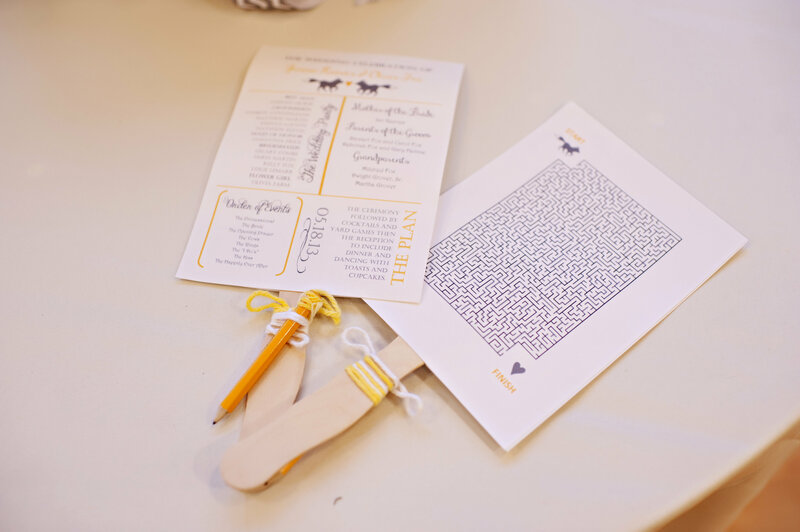 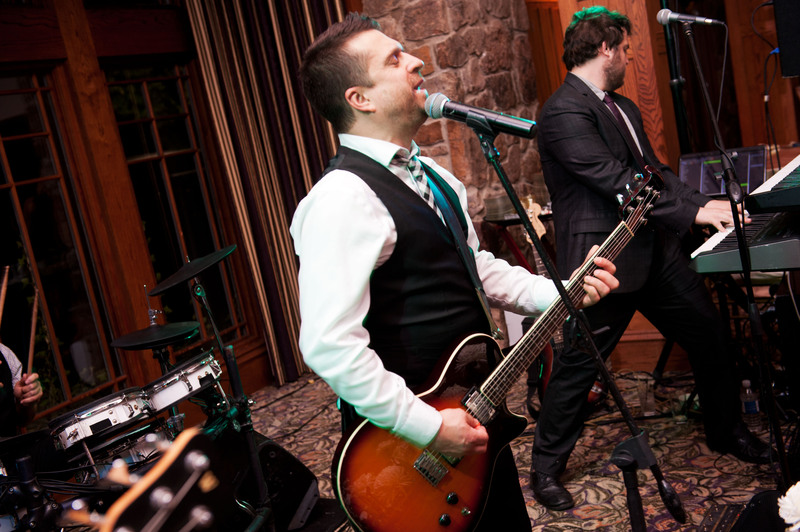 There was not one detail that was overlooked, from the letterpress invitations, to the over the top flowers, the band that kept everyone dancing to the sparkler exit. 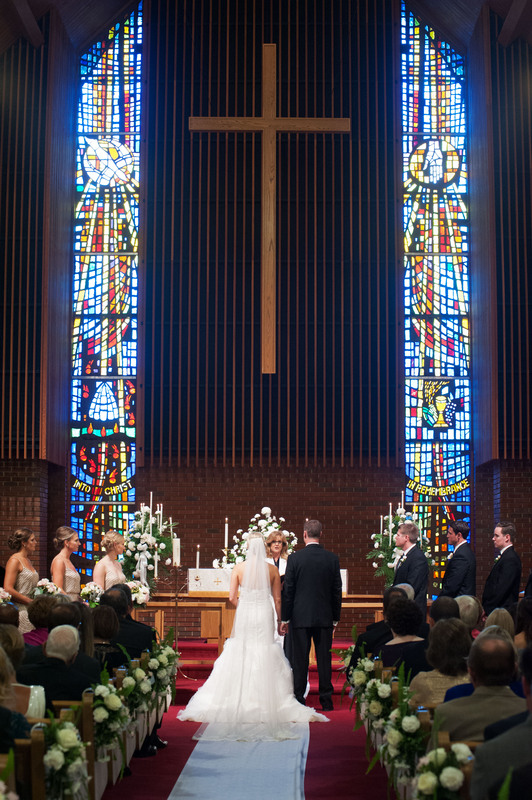 The ceremony took place in Radford, Virginia in a church that Jamie grew up in and the reception took place on the campus of Virginia Tech (where the couple met while going to college) at the German Club. 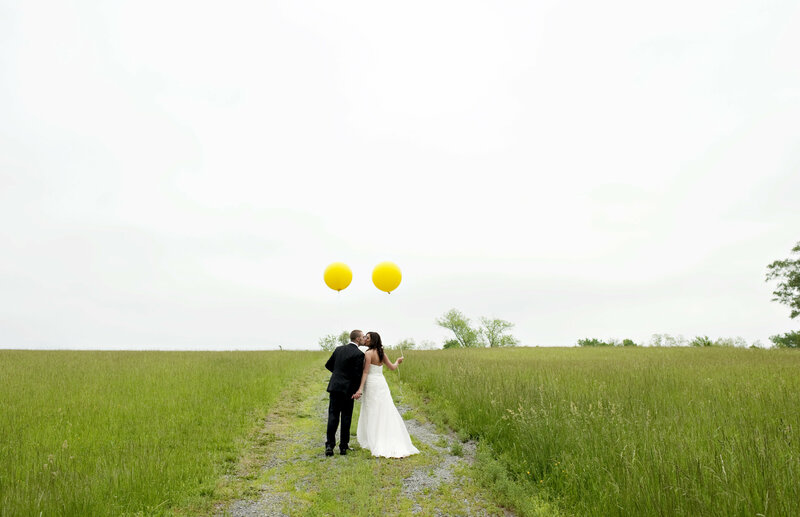 Jenna & Chris married this past May at one of our favorite wedding venues, the Old School House in the village of Waterford (which is a National Historic Landmark) in Loudoun County Virginia. 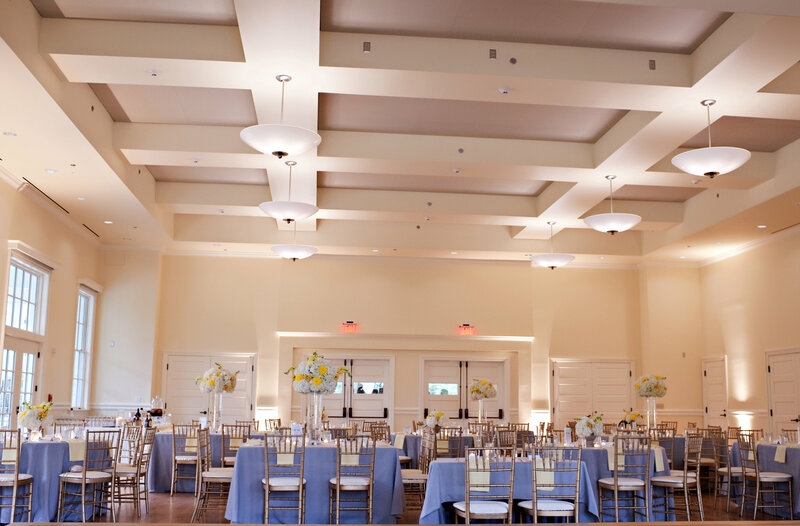 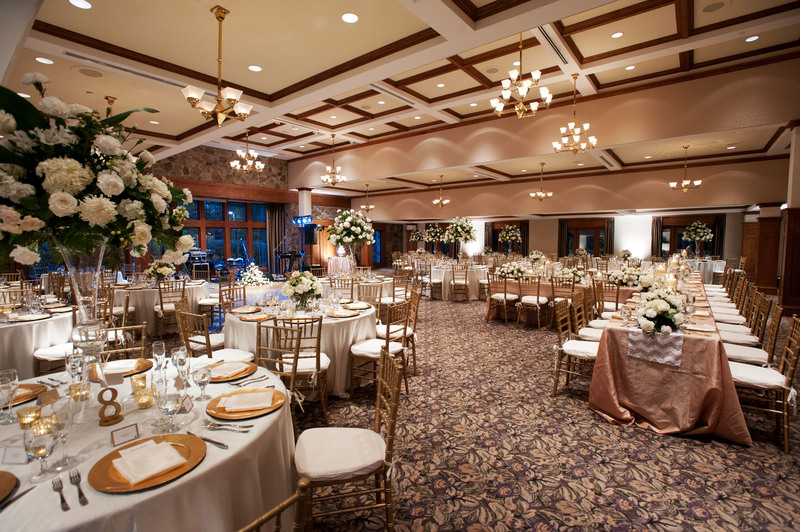 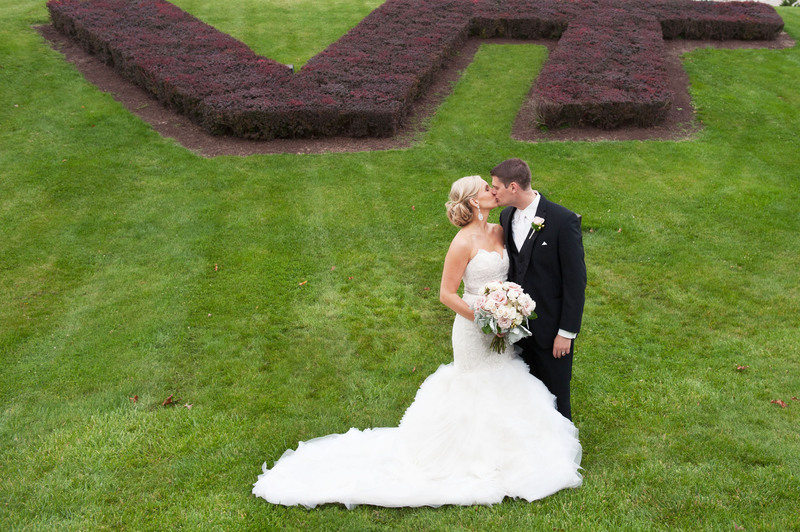 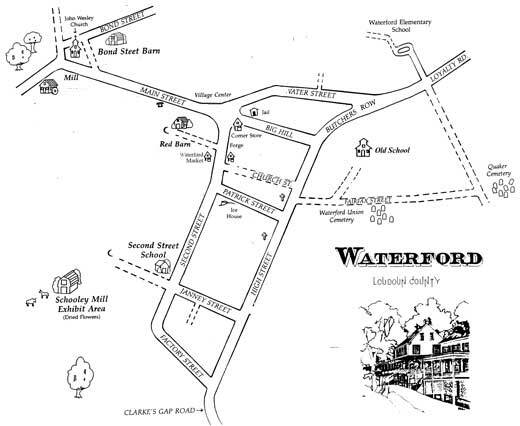 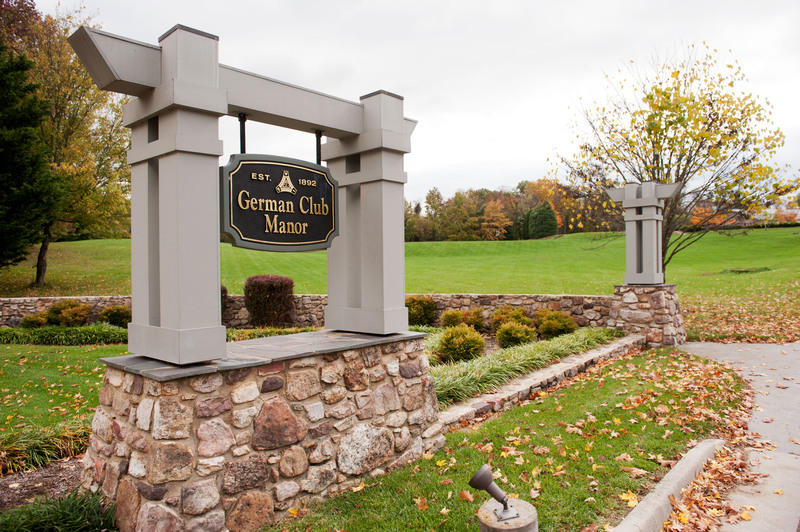 The couple chose Waterford since they had family and friends from Winchester and Northern Virginia; it was a great location in between both locations that accommodated everyone. 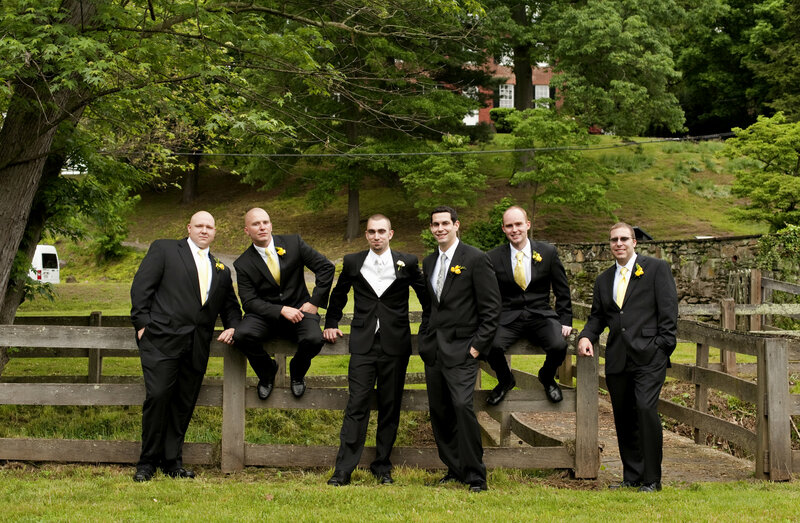 The modern color palette of gray and yellow was a fun contrast against the countryside and stone backdrops for their pictures. 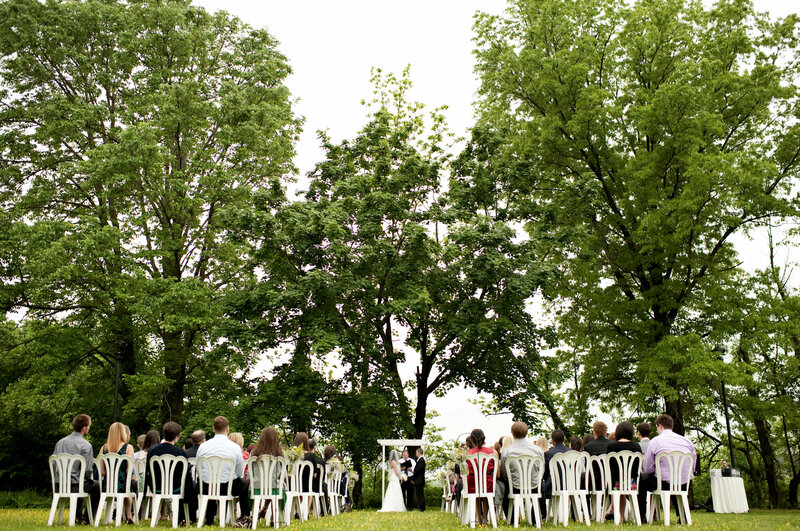 Their ceremony was held in the field next to the Old School that had shepherds hooks with wildflowers lining the aisle and a white arbor and crystal chandelier as their backdrop. 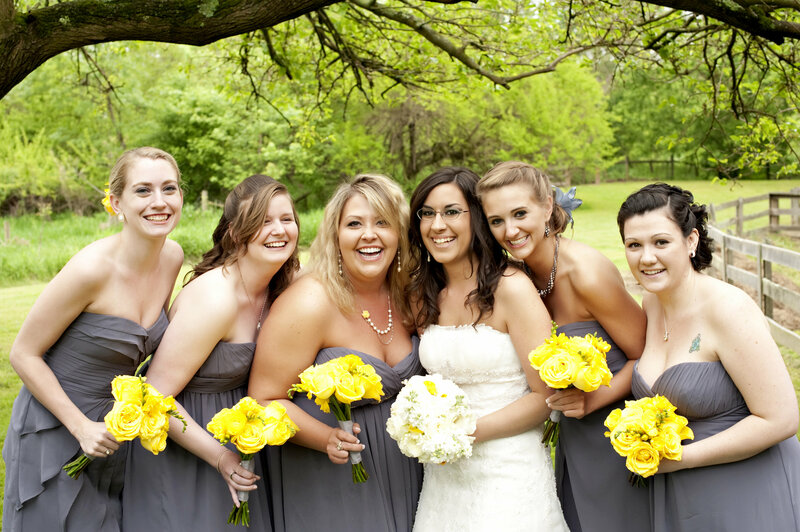 The day before the wedding yellow buttercup flowers popped up and covered the path leading down the aisle, how perfect is that! 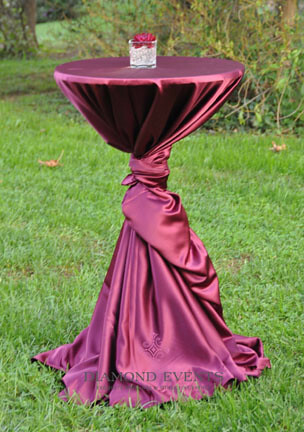 The guests enjoyed cocktail hour on the patio, as well as, corn hole and ring toss games in the yard, while the wedding party made their way around town taking pictures. 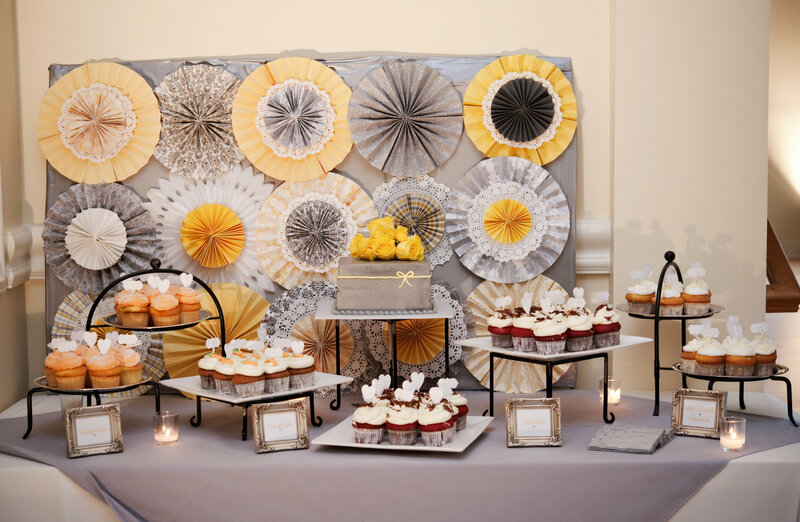 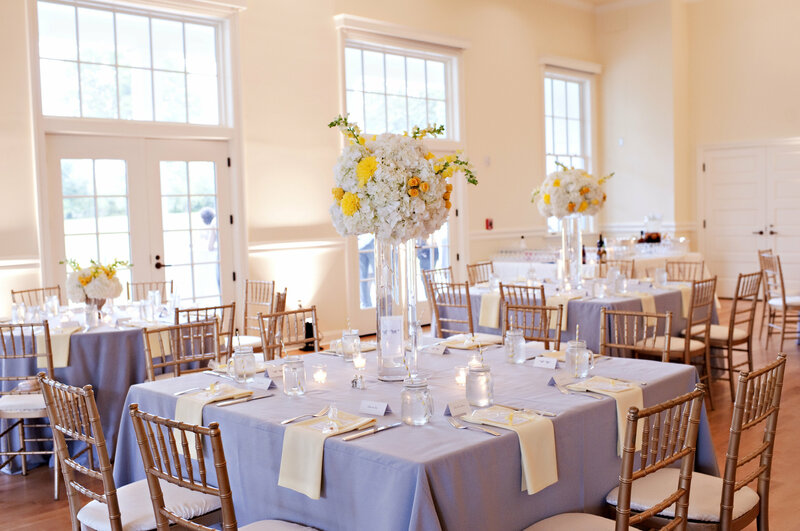 The reception room had alternating round and square tables with gray linens, yellow napkins, gold chiavari chairs and centerpieces designed with hydrangea, spray roses, mums and snapdragons. 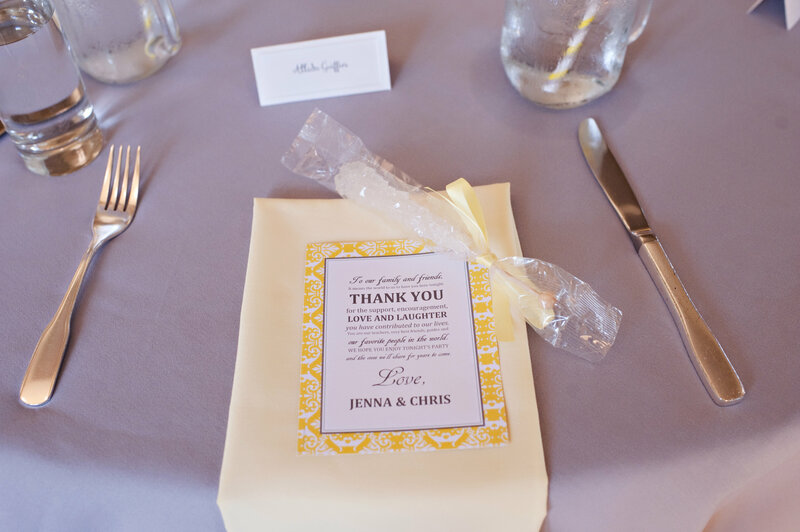 Jenna & Chris, we wish you health and happiness in your life together, we absolutely loved coordinating your wedding and doing your flowers! 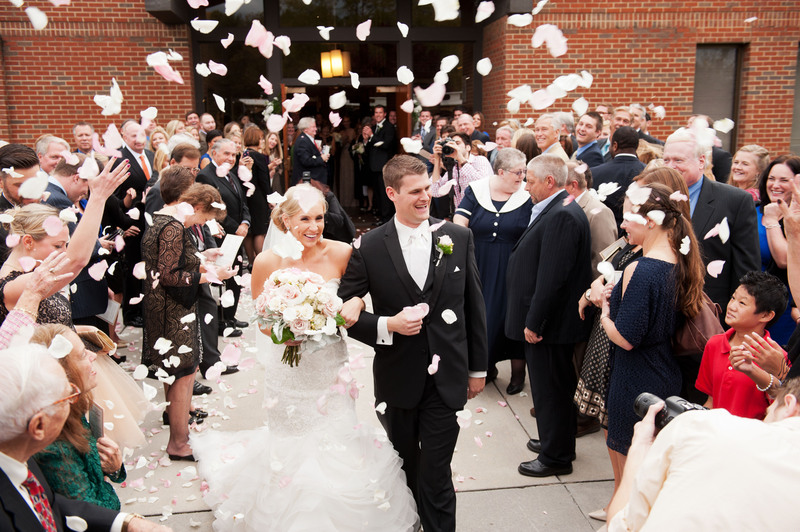 This wedding definitely deserves the “fairy tale” title. 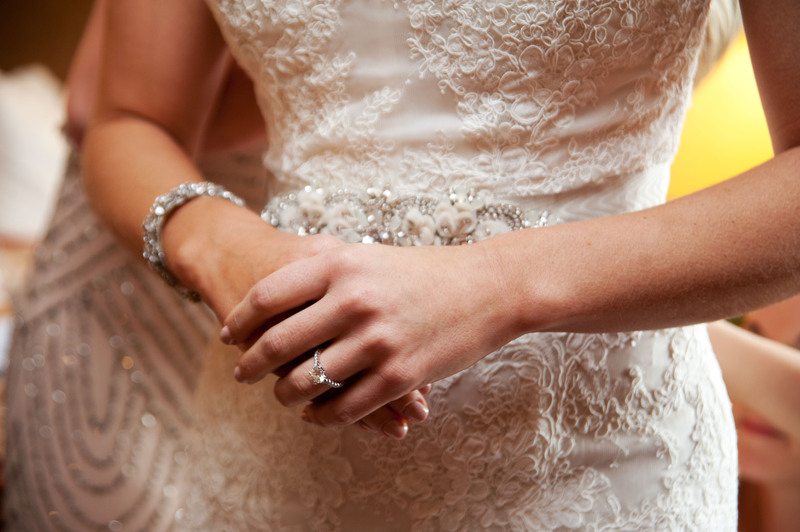 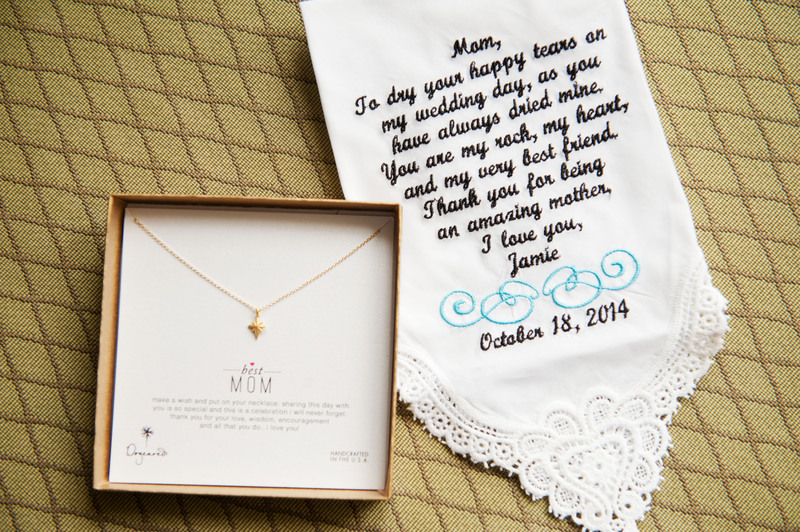 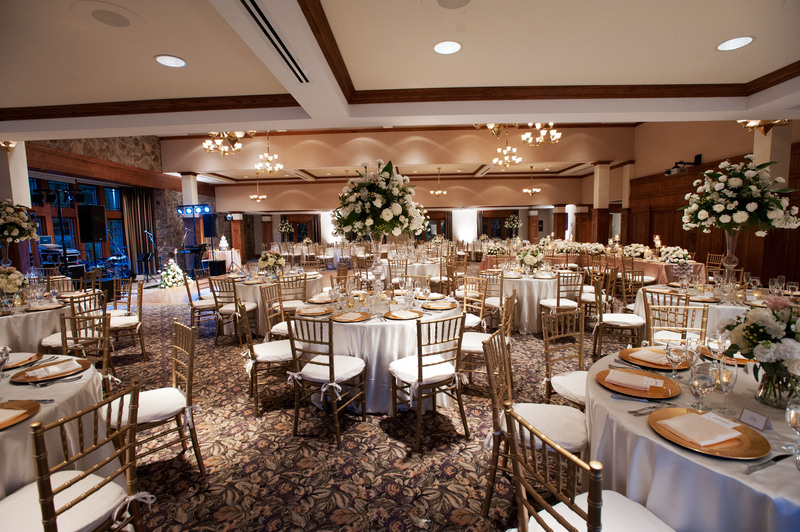 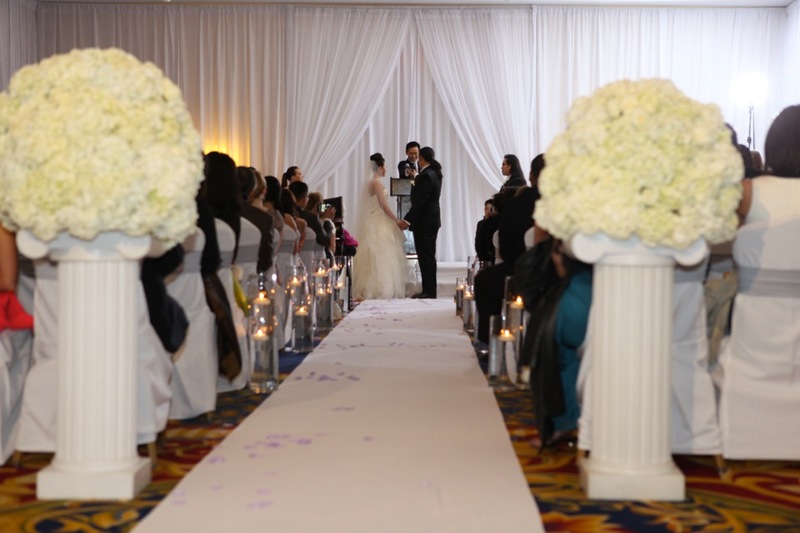 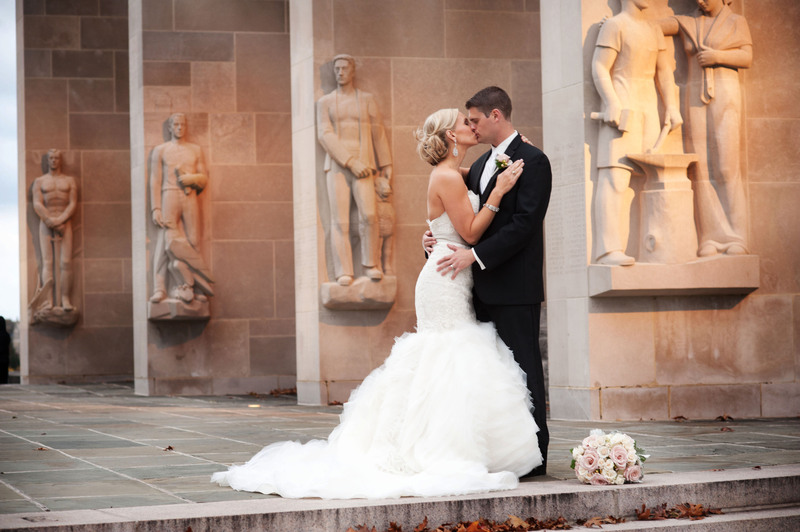 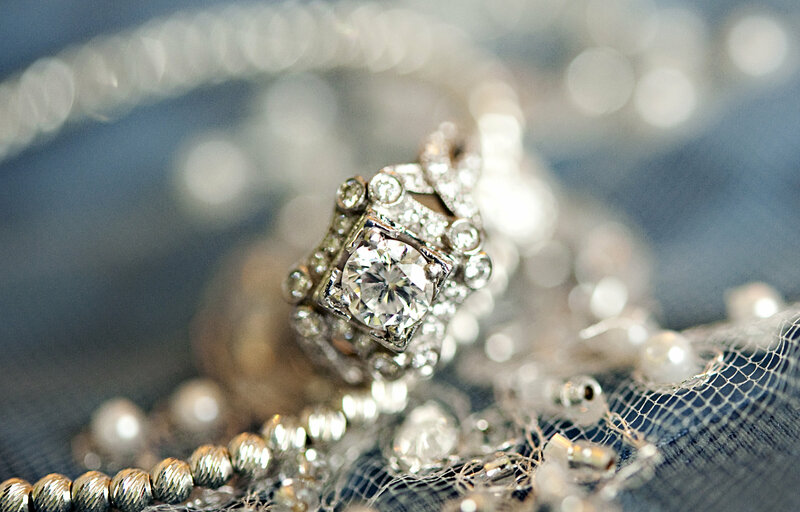 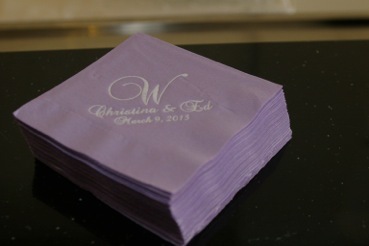 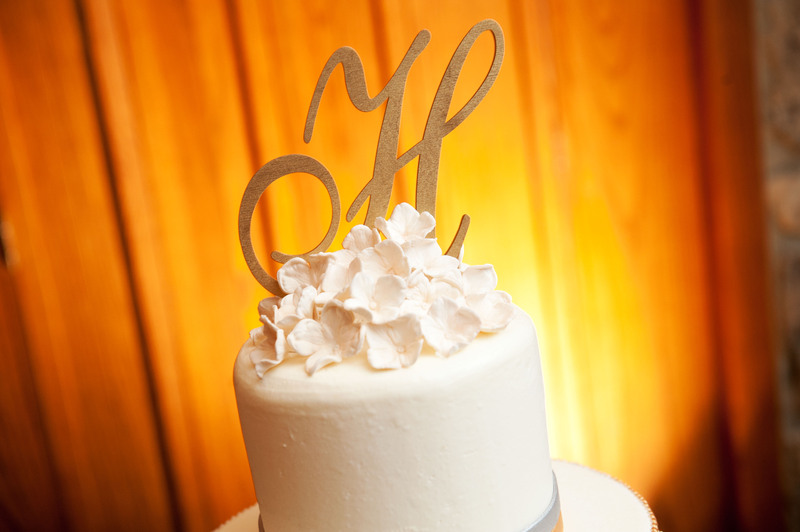 Christina and Ed were married at Westfields Marriott in Chantilly, Virginia in the spring of 2013. 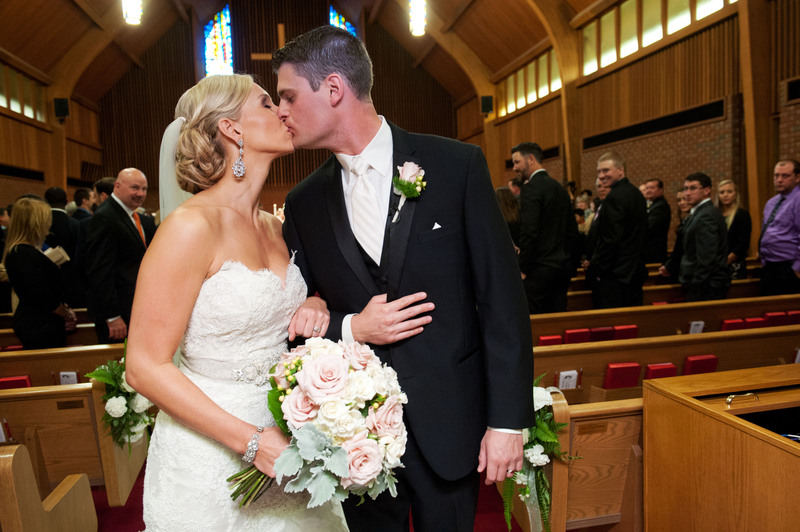 The couple met while in school at Virginia Tech and even though Ed graduated and moved on to pursue his career in the NFL, their love stayed strong with constant Skyping and long distance phone calls. 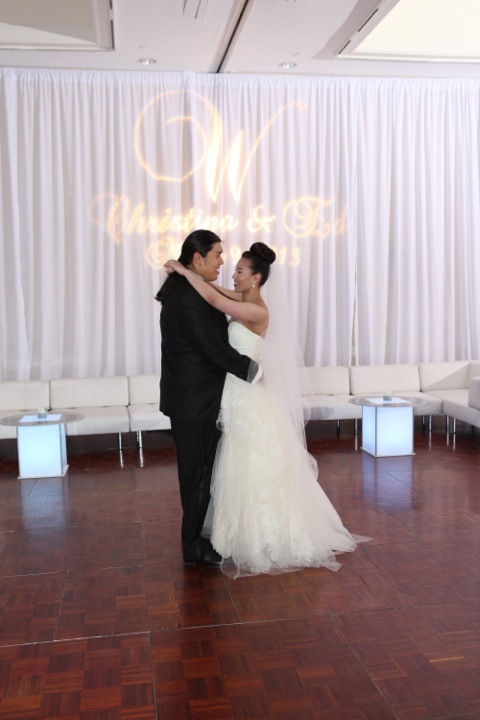 Their over the top wedding was a great example of the love that the two shared for each other, there was not one detail that was overlooked from the custom monogrammed button up shirts for the bridesmaids, the five tier wedding cake, to the plush lounge furniture that transformed the dance floor for the reception, guests were continually being wowed! 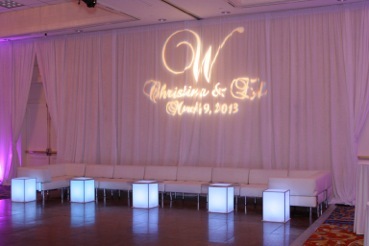 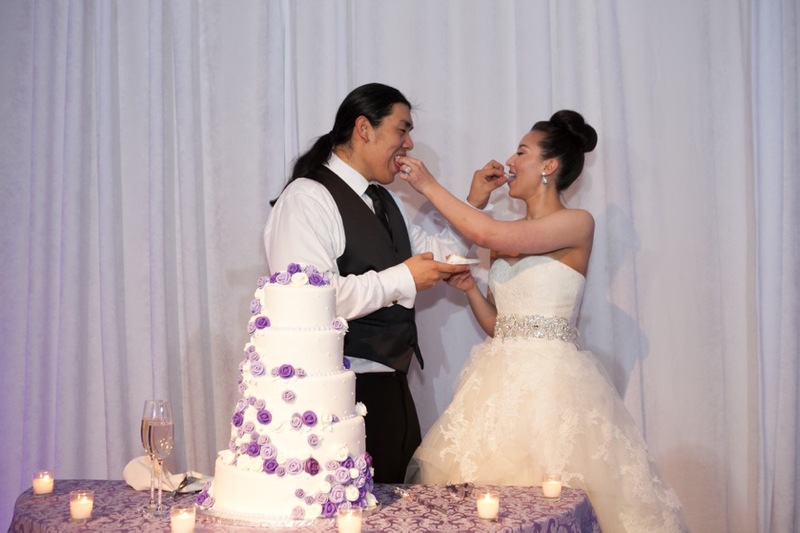 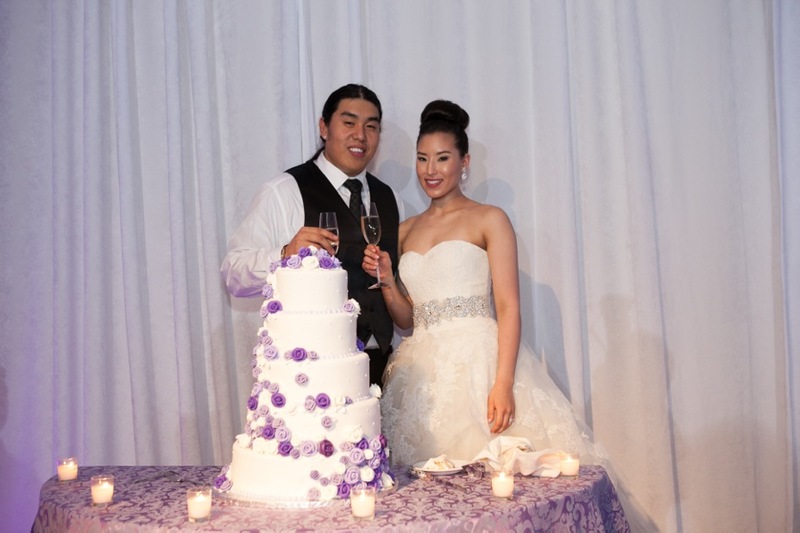 Congratulations Christina & Ed, it was such a pleasure to make your wedding dreams a reality! 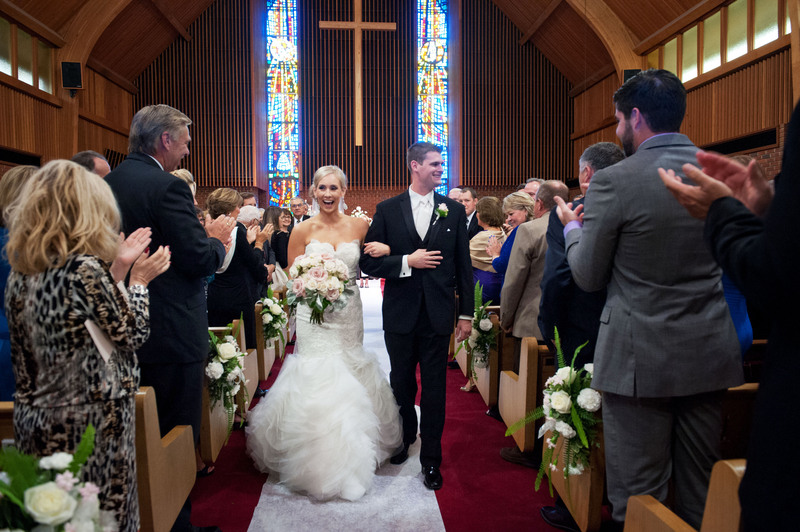 March weather can be so unpredictable but Bekah and Bryan were so lucky, with snow falling (and melting) just days before their wedding, the weather that Saturday ended up being sunny and beautiful. 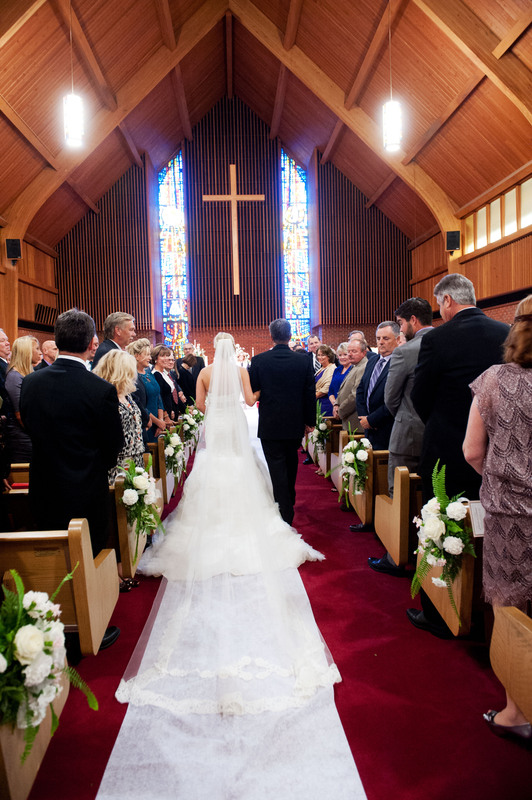 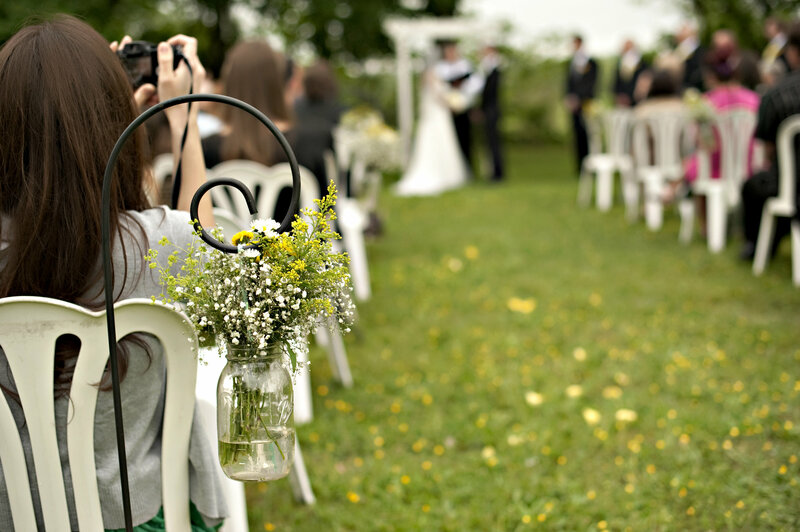 The couple was married at St. Paul’s Methodist church in Christiansburg Virginia and afterwards guests traveled just a few miles down the road to Sinkland Farms for the reception. 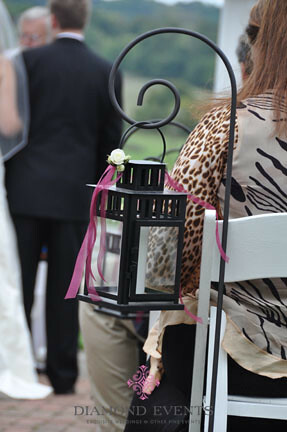 Guests drove around to the back of the property to be greeted by valet attendants, then they walked up a ramp into an enclosed tent where cocktail hour was held. 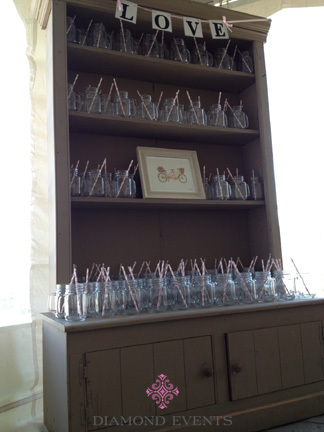 A wooden hutch displayed the mason jars with stripped beverage straws and a table in the center of the tent displayed biscuits on platters that belonged to the bride’s mother. 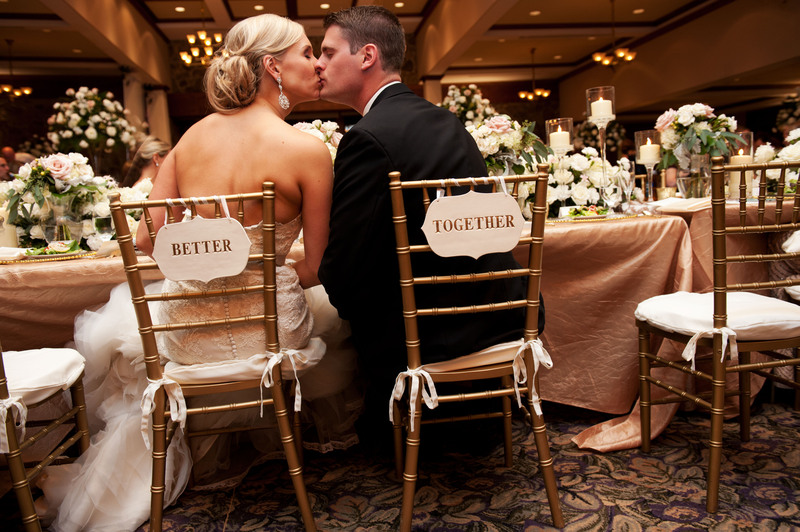 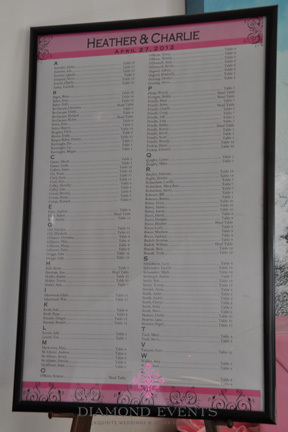 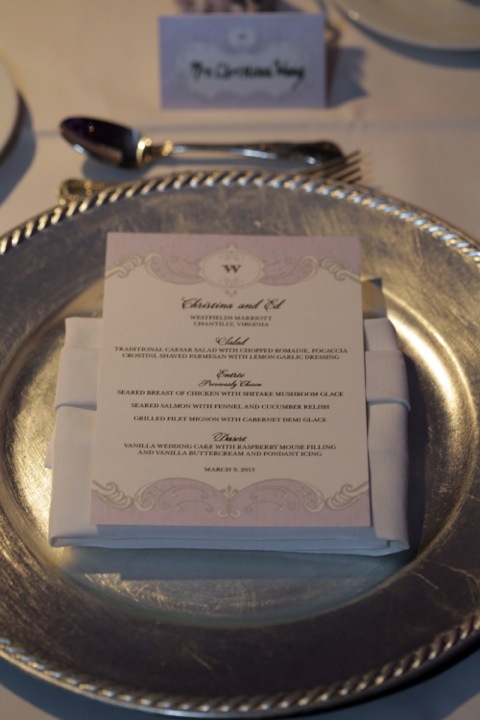 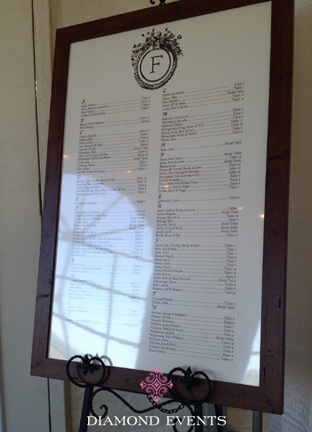 A seating chart poster listed the guests’ names alphabetically so they could easily find their seat for dinner. 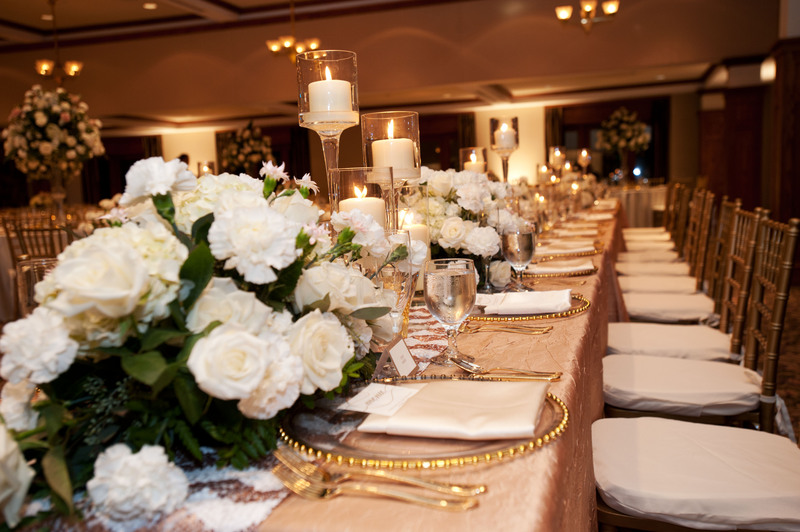 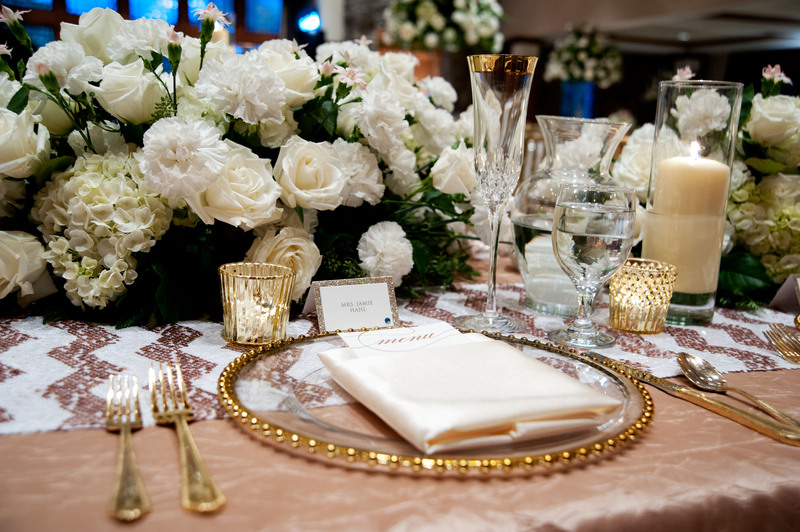 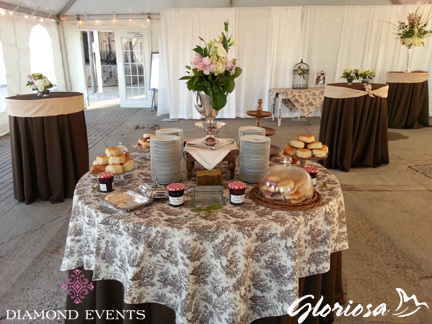 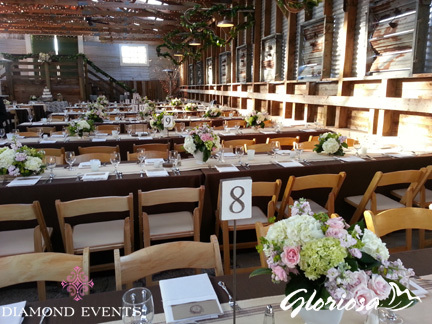 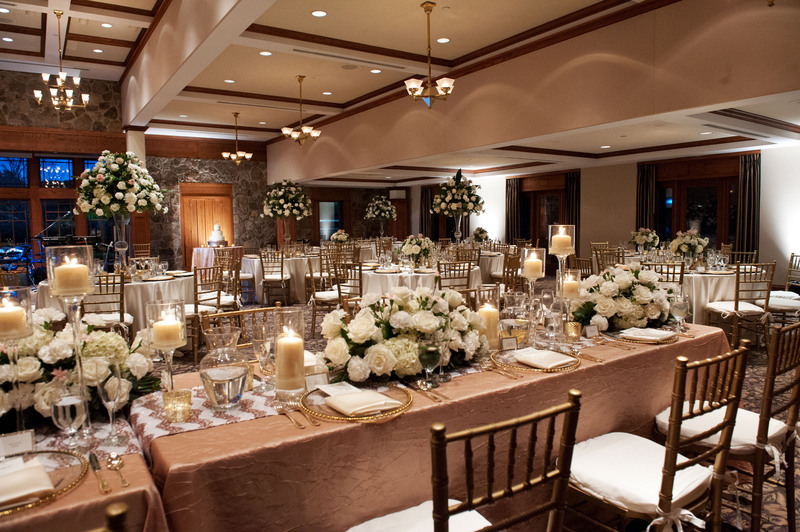 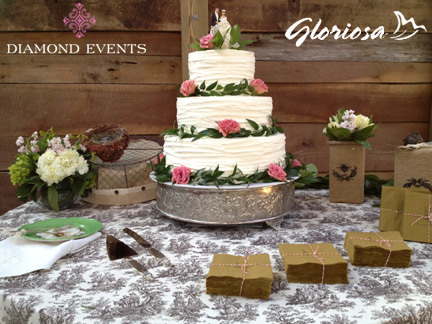 The reception tables were set with a warm brown linen and a toweling runner, the elegant centerpieces were displayed in silver containers designed by Gloriosa. 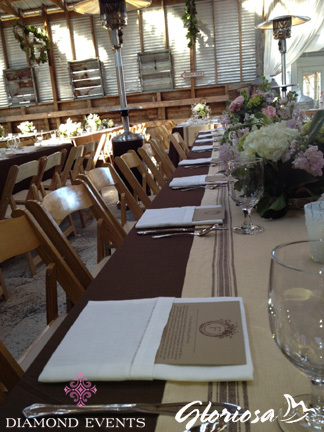 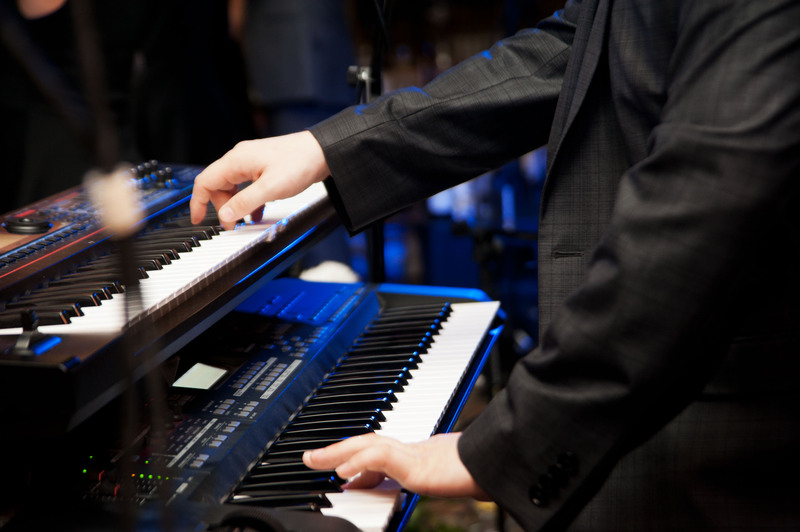 The couple chose to stick with the rustic barn theme and served Due South BBQ for dinner, afterwards guests enjoyed entertainment from a local bluegrass band. 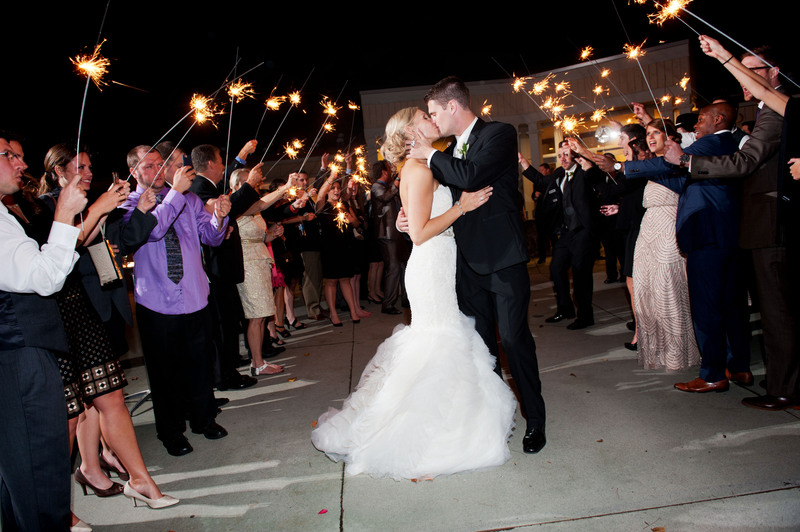 What a beautiful wedding, congratulations Bekah & Bryan! 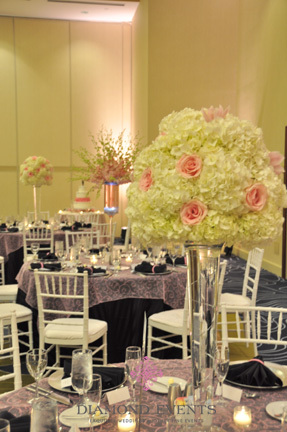 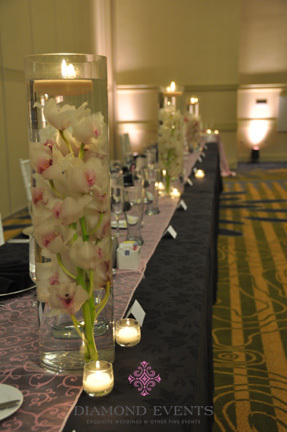 Lots of orchids and 3 different tall centerpieces, what a delight it was for Diamond Events to design Heather & Charlie’s pink, black and white wedding at the Hyatt Dulles in Herndon, Virginia. 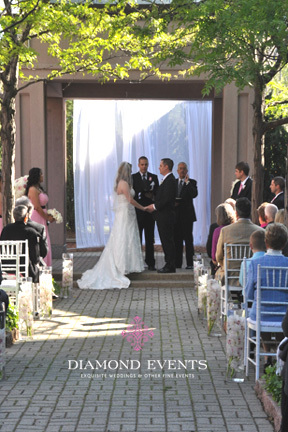 The courtyard ceremony space was the perfect backdrop for an outdoor spring wedding. 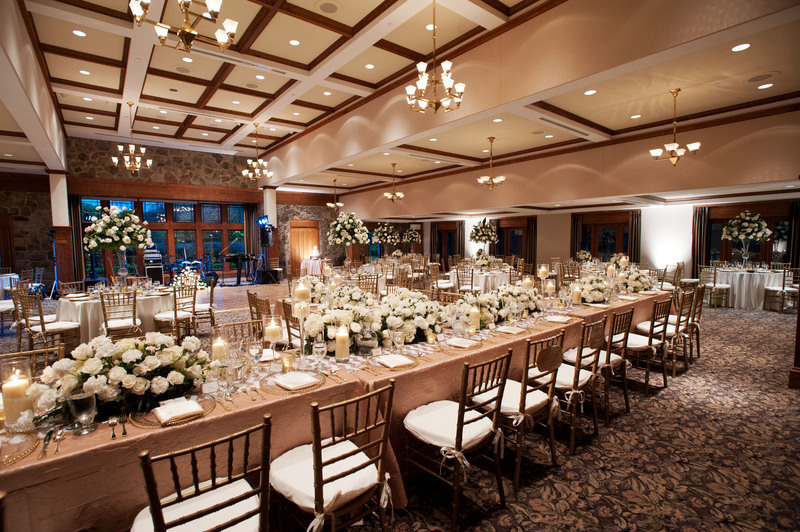 After the ceremony the guests easily transitioned into the foyer for cocktail hour while enjoying delicious food and the soothing tones of a harp. 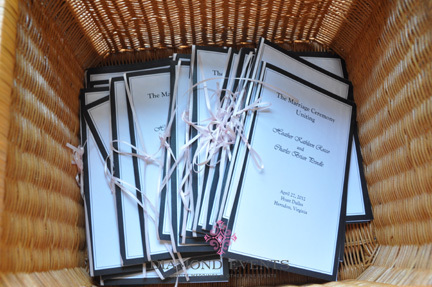 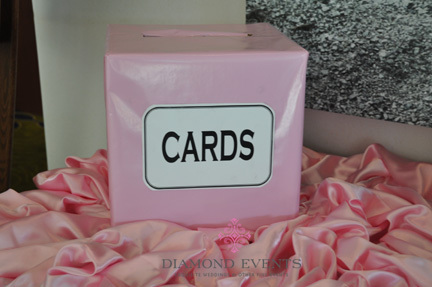 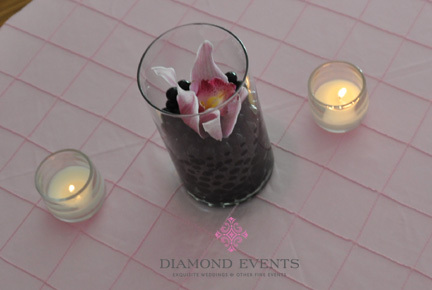 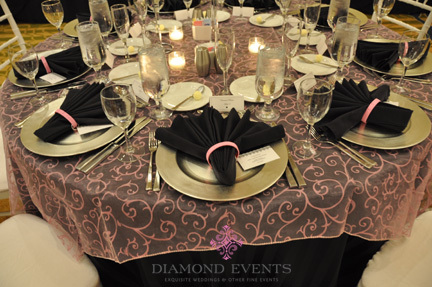 The ballroom was set with a black base linen, pink embroidered overlay, silver chargers and a black napkin with a pink breast cancer awareness band at each place setting. 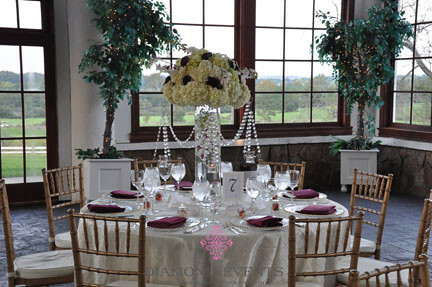 Each table had one of three different tall centerpieces. 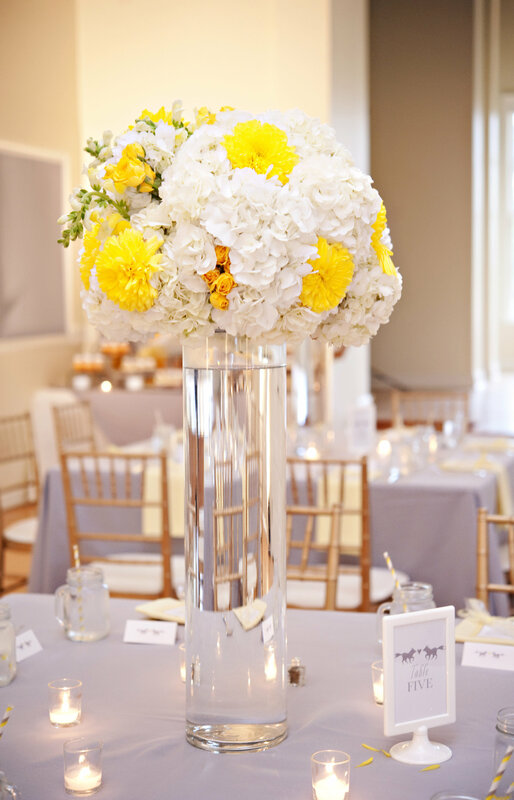 The first centerpiece was cluster of white hydrangeas and pink roses set atop a glass trumpet vase with silver wire swirled inside. 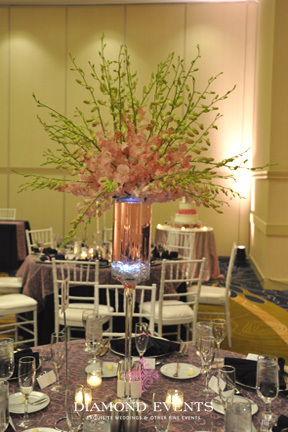 The second centerpiece was a design of all blush pink mokara orchids atop a 28″ tall pedestal vase with pink water and a submersible light inside. 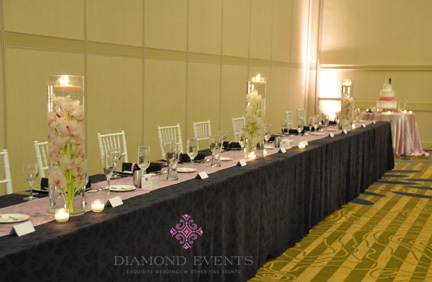 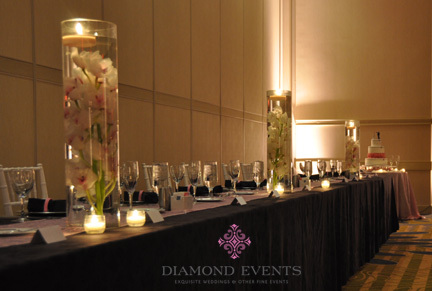 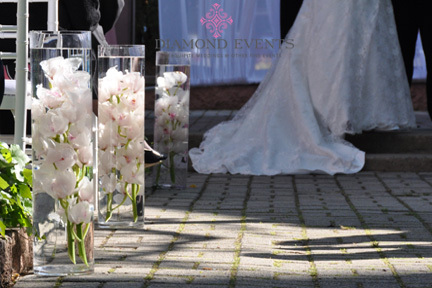 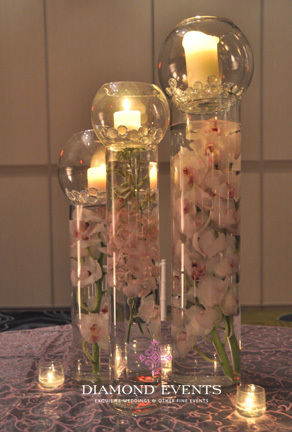 The third centerpieces was a grouping of 3 cylinder vases with submerged orchids inside and a round bubble vase on top with clear stones and a white pillar candle. 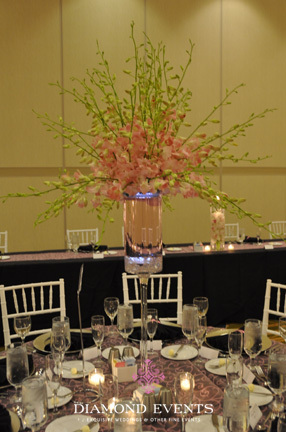 The head table was decorated with 3 of the vase used during the ceremony with with submerged white orchids inside and a floating candle was added to the top. 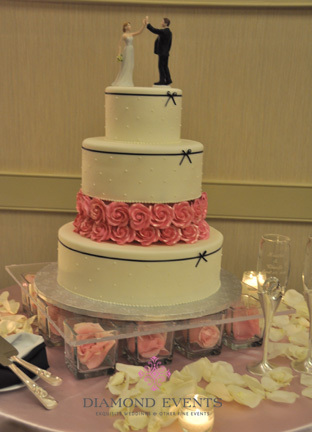 The cake continued the pink, black and white theme with a playful bride and groom cake topper giving “High Five”. 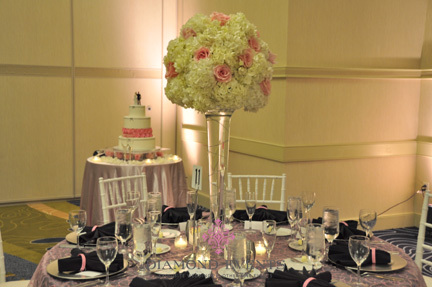 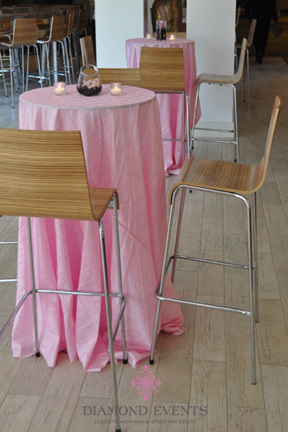 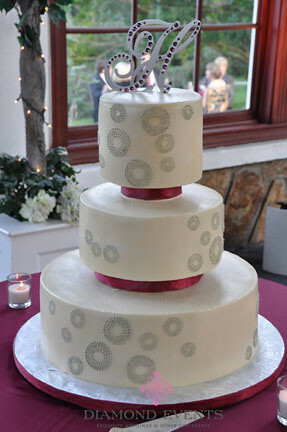 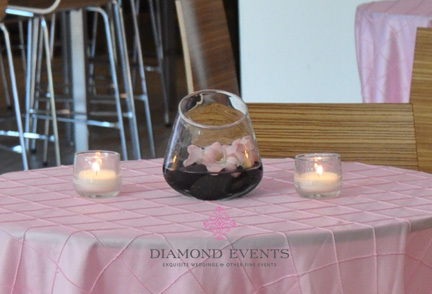 The cake was set on top of plexiglass which was lifted off of the table with clear cube vases with pink roses inside. 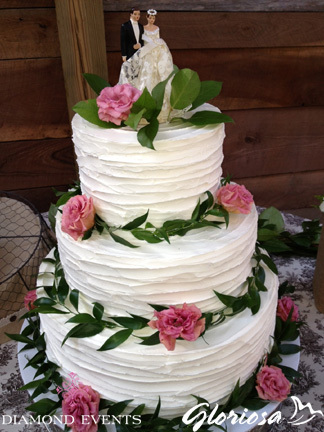 Congratulations Heather and Charlie, what a magnificent wedding you had! 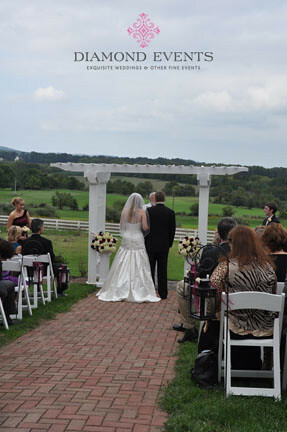 Erin & Chris held both their ceremony and wedding reception at the stunning and historic Raspberry Plain in Leesburg, Virginia in the fall of 2011. 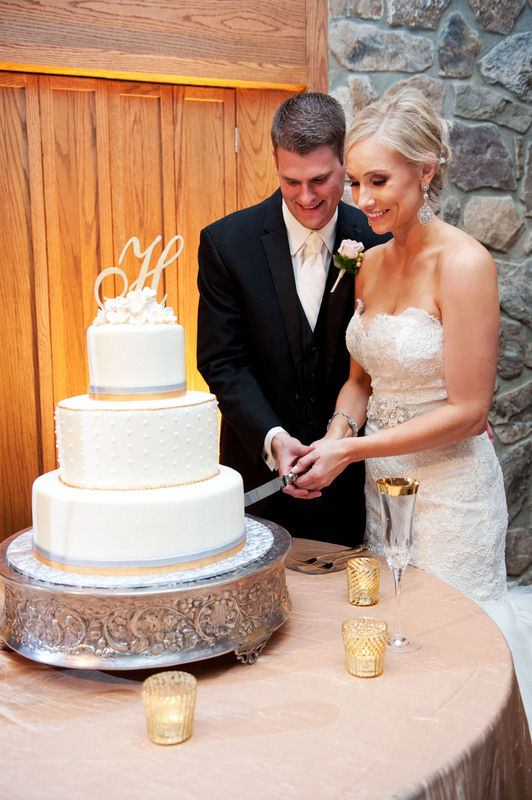 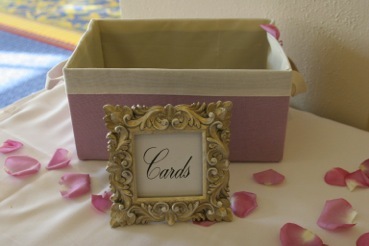 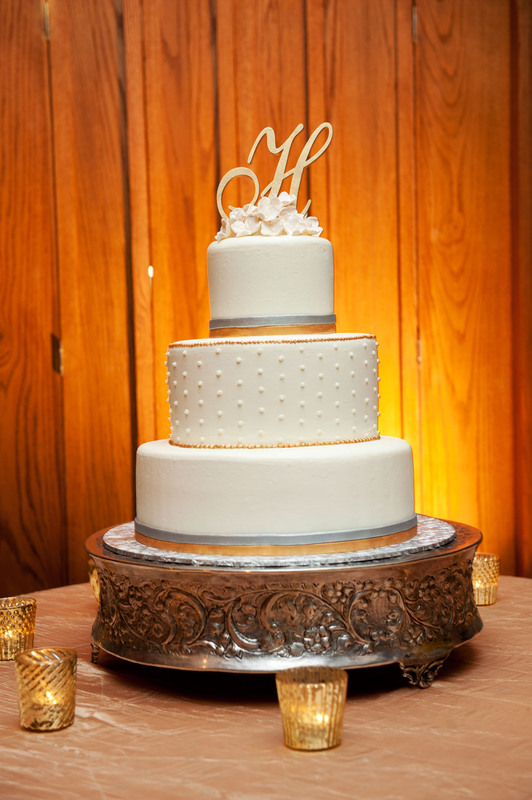 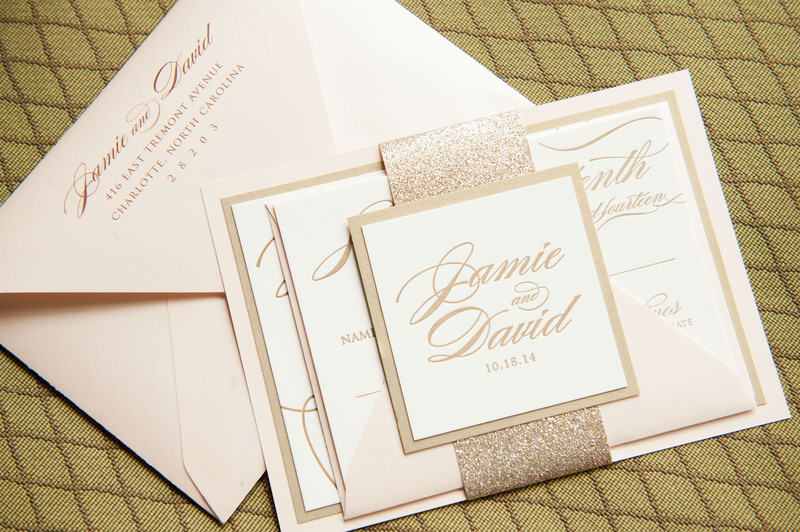 Their colors were “wine”, gray and ivory with gold accents. 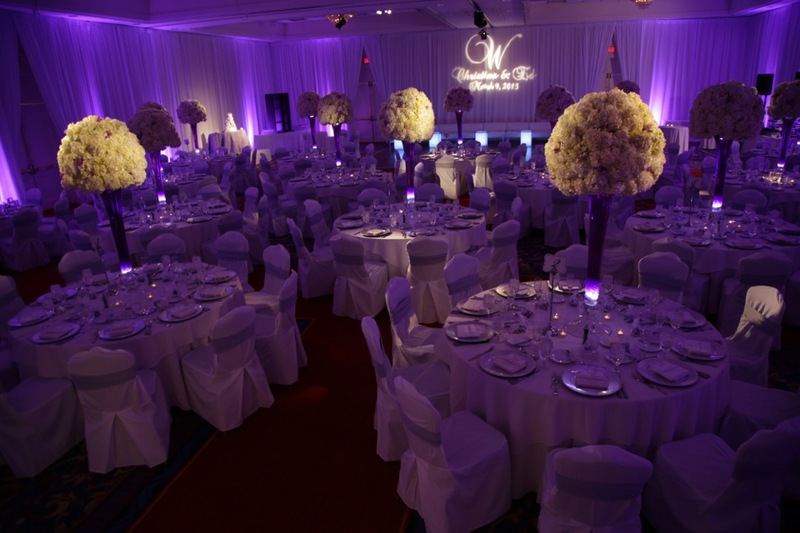 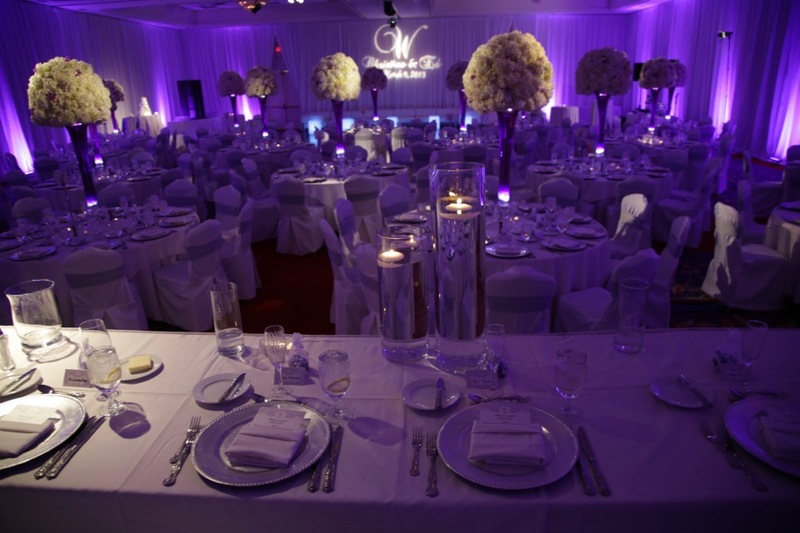 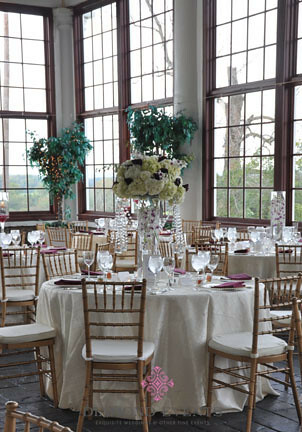 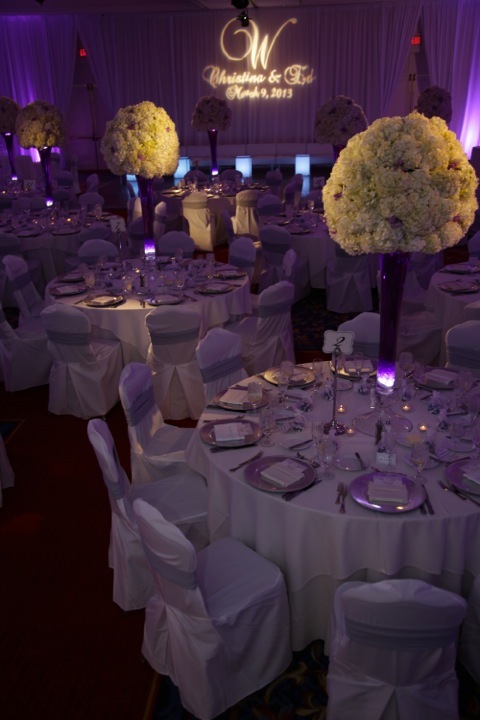 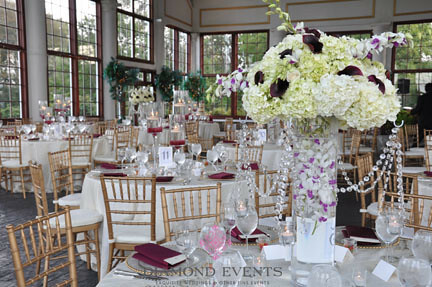 The floral centerpieces were large arrangements of white hydrangeas, dark purple calla lilies and orchids. 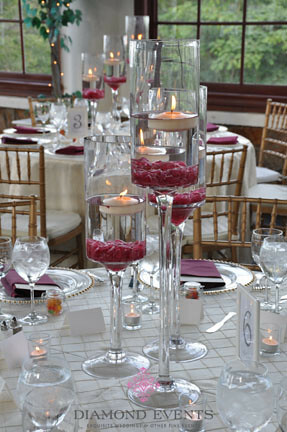 Hanging from the base of the arrangement were swags of crystals and votive candles, giving a romantic glow to the table. 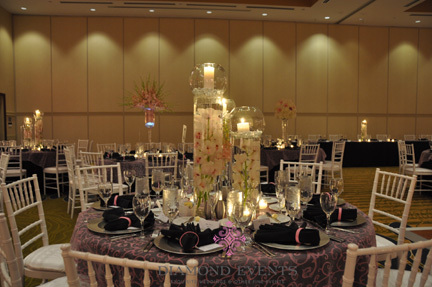 On every other table was a set of 3 pedestal vases 28′, 24″ and 20″ tall with a floating candle and wine colored rocks in the base. 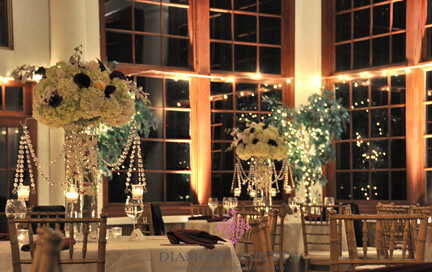 The room looked so magnificent at night, congrats Erin and Chris! 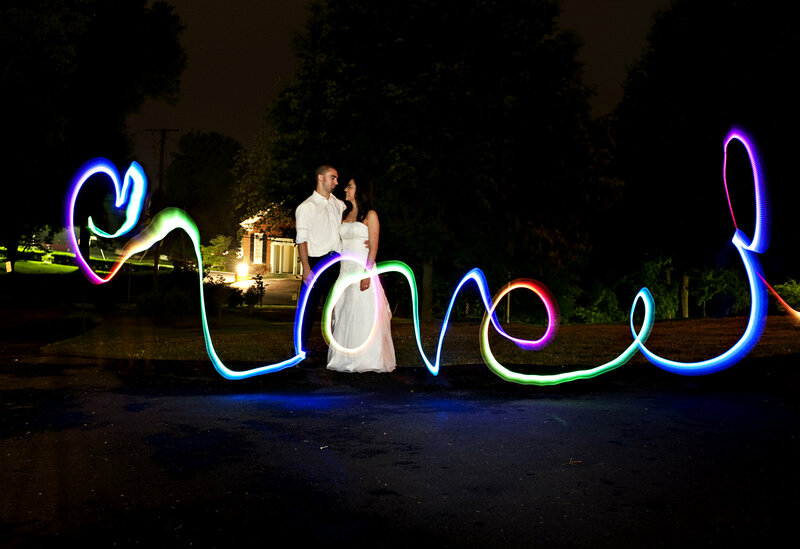 Erin & Chris, a set on Flickr.